The Free Library Book Bike program is now entering its 4th season! The Book Bikes are bicycle-powered mobile libraries that go to local events, bringing a piece of the Free Library outside of our brick and mortar locations. When visiting one of our Book Bikes you can check out a book with your library card, sign up for a card if you don’t already have one, or learn about library programs and services in your neighborhood. With winter upon us, library staff is eager to get back out on the road! "I love to ride the bike to events. I'm a longtime city cyclist and I can honestly say, riding the FLP book bike is the only time everyone on the road including cars, trucks and other cyclists are polite! Most folks along the route wonder if I'm hauling ice-cream. Once, I answered a group of young boys telling them that "no, I don't have ice cream, I actually have something better - books." They begged me to stop. Of course I did and let each boy select a book. They poured over each title, finally picking out a book they liked. They left very happy!" Our first Book Bike event of 2019 will be Saturday, February 9 at the new Rail Park in celebration of Lunar New Year. Also on the horizon for 2019, in the spring we will be participating in Love Your Park Week 2019 which will take place during the entire month of May at different South Philadelphia Parks, in addition to many other great events. 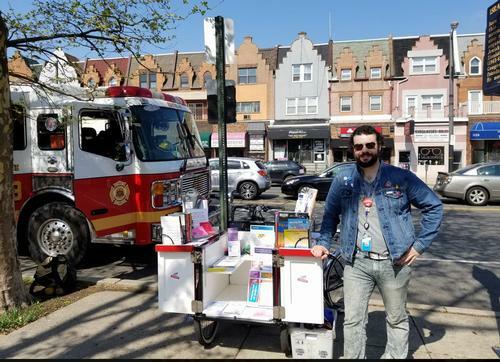 We currently have Book Bike services available in Central, South, and West Philadelphia. 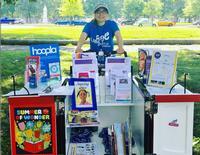 If you’re interested in having a Book Bike at your event, please contact BookBike@FreeLibrary.org. Abbe with the Book Bike during National Night Out. 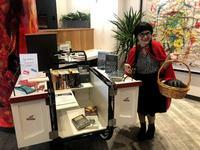 Link with the Book Bike during a Halloween event. Joseph with the Book Bike on Broad Street in South Philly. Add a Comment to The Book Bike Gears Up for Its 4th Season!